Well, I spent last weekend in South Dakota. Other than an airport disaster (it's a long story that I'm guessing no one wants to hear), it was lovely. I got to meet a lot of great people who work in my field and I walked away with a lot of great ideas. The weather was also lovely. Between 50-60 degrees the entire time. Not what I expected, but wonderful nonetheless. I thought it would be a good time to try out an outfit similar to one that I pinned way long ago. I pinned the below image, and while I couldn't incorporate the model-y hand-on-head pose, I was pleased to remember that I had this puffy vest that hadn't seen a lot of light for a few years. Bam - outfit! How often do you try to replicate outfits that you pin? pinterest is always a great inspiration & you pulled it off flawlessly!! I think I have the same vest! I'll have to wear it like that! I like it. Great way to wear plaid. I'm a huge plaid fan, although I really don't have any. Haha, I wondered the exact same thing about that picture! Why does it say "GQ" on it?? I'm afraid to look at a GQ magazine because I think you're right - the models are only half dressed! Great look! 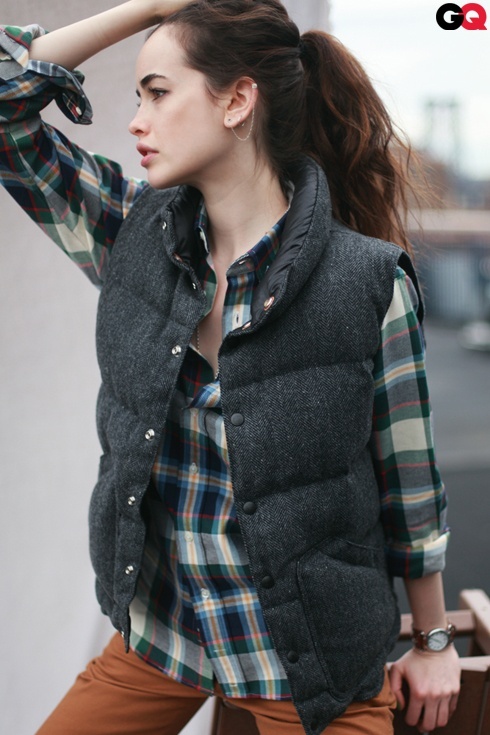 I love puffy vests, and especially like this look with the plaid shirt. Love your version and the pin! Your vest is so cute - love the little details by the buttons! I wish I would have saved some of my vests from years ago! I know - I never would have thought that I would be glad that I saved my vest! Love it! The plaid looks so good! P.S. By the way, last Sunday, your outfit was among others features on my new Sunday Feature titled "Week's Best Looks". Did you check it out? I did see it, Ada! I left you a comment - such a fun idea! I'm not sure if I'll ever move to more outfit posts... there are so many other things I want to blog about so we'll see! What a fun Fall look. I haven't worn plaid yet this season, but want to start. Such a perfect fall outfit! I've been planning on rocking a vest with plaid too, just haven't gotten around to it yet...definitely need to after seeing your awesome pairing though! Super cute outfit! I just love those boots!